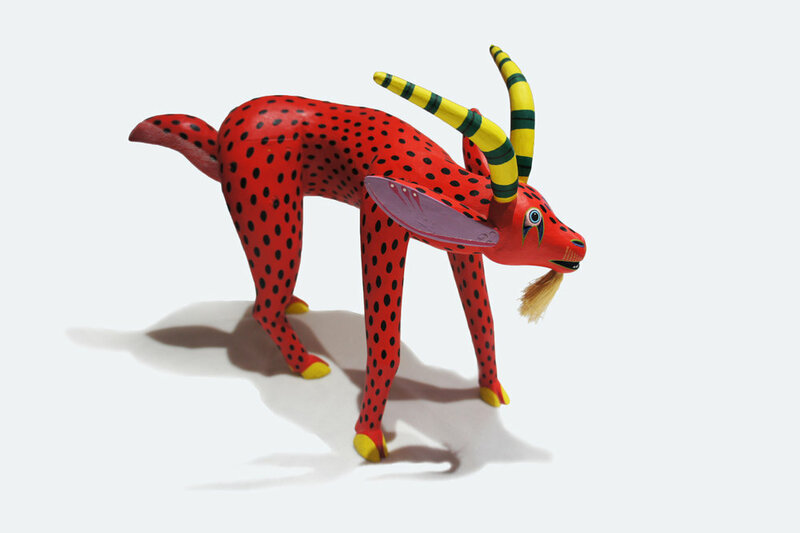 The Museum's exciting special exhibit, “The Colors of Life” (in Spanish, Los Colores de la Vida), showcases a number of brilliantly colored contemporary folk art pieces acquired from artists and craftspeople working in Latin American countries. Guest curated by local artist, Diana Schmidt, the work in this exhibit highlights the fine craftsmanship produced by artists and artisans from this region. On display is the expert work of several well-known individuals and artisan families that produce clay muñecas (figurines), carved wooden animalitos (little animals), costume and display textiles, retablos (sacred images), masks and more. Artists of note include Josefina Aguilar, Angelica Vasquez Cruz and Agustín Cruz Prudencio, among others. One medium showcased in the exhibit is Oaxacan wood carving. The tradition of animal carving in the Oaxacan Valley dates back centuries to when the Zapotecs created religious totems and ceremonial masks during the pre-Hispanic period. After the Spanish conquest, carvers started to incorporate Christian imagery such as angels and crosses into carvings. Figures and masks as representations of Biblical passages also became common. The wooden animalitos are often hand-carved from the naturally twisted and curved branches and roots of the female copal tree, native to southwestern Mexico. This preferred carving medium is lightweight and easily worked with machetes, knives, and chisels. After carving, the wood is dried and sanded to a soft, smooth finish. The pieces are then hand-painted in intricate patterns and bright contrasting colors that make the completed sculptures vibrate with life. The art on display in The Colors of Life is on loan to the Museum from the private collections of Diana and Chris Schmidt, Katherine Wildermuth and John Jamison, and Lou Ann and David Casper. The exhibit will close on February 28, 2018. Funding for this exhibit has been provided by the Wildhorse Foundation, Clara & Art Bald Trust, K.B. Wells Charitable Trust, Bill and Bonnie Szuch, Blue Mountain Community Foundation, and Leonard and Shirley Isaacs.